A few weeks ago I stopped at a garage sale in Brooklyn and found a stack of Nintendo Power magazines. Nintendo Power, for the non-80s kids, was a magazine produced by Nintendo from 1988 to 2012. It was full of tips and tricks and even had walkthroughs of popular games. If you had an NES it was required reading and, boy, did I read it. Opening the pages of Nintendo Power, almost three decades later, I felt a flood of nostalgia. It was like meeting an old friend. There they were: the bright colors, the magazine’s mascot, Nester, the screenshots from games that defined my childhood, and the Power Player, a gamer handpicked by Nintendo for special honors and privileges including, but not limited to, having their picture in the magazine. And the first issue I picked up at the garage sale featured a kid, a Power Player named Andy Cunningham. I remembered Andy or at least I thought I did. Andy represented a whole bunch of stuff. He was an example of pre-Internet nerd fame. He was picked out of a slew of kids to appear in the pages of one of the most popular gaming magazines in the world. And he, to my 15-year-old brain, was a true Power Player. How did it happen? Why? And why wasn’t I picked? Andy was 14 in 1990, a year younger than me, and he was one of the special few chosen by Nintendo Power to appear in its storied pages. That issue, which featured Super Mario Bros. 3, was particularly special. It was the beginning a new decade and NES was truly pushing its limits, pumping out clever and playable games, a Golden Age that came just before the launch of the Super NES and the revival of the true console wars. So Andy was pretty special. So there I was, reading a 27-year-old magazine and musing on Andy. I wanted to find him. Andy reached out on Facebook and I asked if we could run an interview. He agreed. He’s a normal guy, living with is family far from North Carolina. I asked him how he happened to end up in Nintendo Power and how he felt being one of the coolest kids in the world for a few days. He answered and I wanted to share what happened after a 14-year-old boy became to Power Player of Power Players. TC: Tell us about your experience with Nintendo Power. How did you make it into the magazine? Andy: Like nearly every other boy who grew up in the 80’s, I was obsessed with video games in a big way. I came up on the ColecoVision, and played Intellivision, and even a home version of Pong at my neighbor’s house. We also spent a lot of time at the arcade, playing all the classics; Galaga, Joust, Pole Position, etc. The release of the Nintendo Entertainment system was the rebirth of home gaming after the crash of Atari. Pretty much every spare moment I had was dedicated to playing my NES, and trying to “beat” games. I remember 12 hour stints where I didn’t leave my bedroom, as I struggled to conquer Mega Man, Ninja Gaiden, or some other title. I read Nintendo Power religiously, and it was my dream to someday work in the gaming industry. I was also really into using my family’s computer (a 128K Macintosh that had been upgraded to a 512K “Fat Mac”) to create artwork. 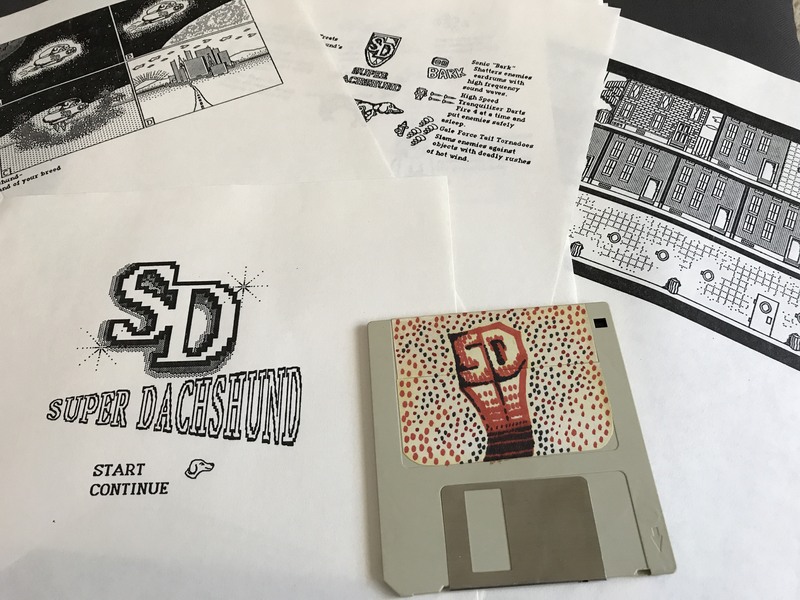 While I had very little in the way of programming skills (about the best I had was some BASIC and Hypercard), I was pretty good in MacPaint, the bundled raster graphics program that came with the Mac. So I set about storyboarding a side scrolling arcade game based on our dog, Sam, who was a “Super Dachschund”! After weeks of laborious pixel by pixel editing, I printed out all of the artwork on our dot matrix printer. I then sent it to Nintendo Power magazine with a letter detailing my love of the NES, and describing all of the games that I had finished. I was shocked that they selected me as the featured “Power Player” for March/April of 1990. TC: Who were you then? TC: Who are you now? Andy: I now work in the IT industry as a Senior Systems Engineer for a well known social media company. My first “real” job was in the graphic arts industry after college, where I worked on Macintosh workstations using Adobe Photoshop and Illustrator to create commercial art. I later decided to focus on Mac IT support, and worked as a consultant for a time. I then went on to work in IT at a university in Indianapolis as their “Mac Guy” for nearly a decade before taking my current job on the west coast. I now live in the Bay Area with my wife and young daughter (who is a huge Minecraft fan). I honestly credit video gaming with the career that I have today. Games were my gateway into the world of computing. If I had never been into gaming, I seriously doubt that I would have pursued a career in IT. While I argue with my wife about the merits of gaming for our daughter, I feel that there are many redeeming qualities that can be gained through gaming, such as diligence, attention to detail, cooperation, and storytelling. I plan to raise my daughter as a gamer, and encourage her interest in all things geeky. TC: Making it into Nintendo Power was a big deal in the pre-Internet age. What is the equivalent now? Andy: My fame for being in Nintendo Power was extremely short lived. I don’t even think that anyone at my school noticed (despite my best efforts to toot my own horn). My close friends found out about it, but it didn’t mean as much to them as it did to me. I guess that it was a private victory at the time. I don’t know if there is a direct equivalent today. Everything that happens gets posted to social media instantly, so everyone is automatically in the loop when something happens, for good or for ill. That said, social media allowed you to find me all these years later, which is pretty amazing in and of itself! TC: Did it change you at all? Andy: Other than giving me a big head for a while, not really. If anything, it encouraged me to continue my gaming pursuits. I felt that my video game obsessions had been validated, which made me want to continue. TC: Do you still game? Andy: Absolutely! I play console games, PC games on my Macintosh, and mobile games on my iPhone. My current obsession is Hearthstone, which I spend way too much time playing (badly). I also play fifth edition Dungeons and Dragons regularly, and enjoy board games like Catan Junior with my family.